I can’t believe I am now actually writing a review because I finally own a Prestige Pomsky! Prestige Pomskies have been fabulous ever since we first enquired about a pomsky. The communication has been great the whole time we were on the waiting list and after litters have been born. All of the dogs are gorgeous, and the dogs/pups are all cared for so amazingly! We're so happy that we chose Prestige Pomskies, as we now have the healthiest and most perfect little pup! Any questions we have had have been answered promptly, and we've been supported the whole time! We can't thank them enough for everything!! We are so happy with our gorgeous pomsky pup. Prestige Pomskies are excellent breeders who we would recommend to anyone interested in this amazing crossbreed. Jessica obviously loves her pack and this is reflected in care that every puppy receives. They are brought up in a family environment with lots of love and cuddles and so make great family pets. Jessica is always happy to answer questions and give advice, and she matched us to the right pup for our family. Since bringing our little fluff ball home Jessica’s been available for encouragement and advice. She has also created a lovely community for people who now own a Prestige Pomsky, so we can keep track of all our puppy’s litter mates and organise meet ups in the future. We can’t recommend this excellent breeder highly enough! Prestige Pomskies have been brilliant at every stage and we couldn’t have asked for more having just homed beautiful pup Theia from Skye’s little universe. From the moment we got in touch with her she responded quickly to every question we had, and visiting her and the rest of the pack just confirmed that she was the breeder for us. Her passion is clearly evident- bringing up beautiful and well rounded dogs. Theia has adjusted really quickly to her new home with us and is a real credit to Jessica - so comfortable with meeting new people, children and other dogs. We loved the regular updates we had including lots of photos and videos before bringing our pup home. We feel so lucky to be part of the Prestige Pomsky community and know that Jessica is there to support us as Theia grows up. We couldn’t recommend her highly enough! I know I’ll find it hard to put into words how much I recommend Prestige Pomskies and specifically Jessica and her lovely family. Our whole puppy journey has been incredible. From her honest advice and ‘list of things to consider’ when first looking to own a Pomsky, right through the process to now owning the most gorgeous dog I’ve ever known (possibly bias! ), she has been invaluable! Stuart and I were blown away by her obvious care and dedication to looking after the puppies at every stage of the process though to keeping in touch now! My confidence in Georgie, our puppy, taking him out and introducing him to friends and strangers alike stemmed from the socialisation and hours of work she has put in before we picked him up. We can’t thank you enough and are smitten with our very gorgeous puppy!!! If I could give Jessica at Prestige Pomskies 10 stars I would!! She is absolutely fabulous as well as her dogs. Fast forward to September and we’ve now got our little Lola from Skye’s litter. She is the best little pup. So good with other dogs and children. She is super clever and settled into her new home very quickly. As first time dog owners we’ve had lots questions before we got Lola. Jessica goes above and beyond to provide support and help answer any questions. This support doesn’t stop once you pick up your pup. Jessica is always there to help. She has also built of a lovely community of other prestige dog owners that are always available to offer up tips and tricks they’ve learned along the way! We are so thrilled to be a part of the Prestige Pomsky pack! 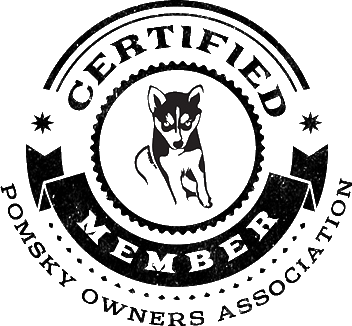 I got in touch with Prestige Pomskies last winter and felt immediately a great connection with Jessica and her way to work with both the dogs and the customers. Even before I paid the deposit to get onto the waiting list she was very helpful and kind, got all my questions answered and didn't rush anything. This was new to me since many other breeders just want you to get your money as soon as possible. During the spring Jessica continued to send us updates, photos and everything you can ask for from a breeder, all questions got answered and we even flew from Stockholm to visit Jessica and the pack in their home. I can recommend Prestige Pomskies from the bottom of my heart, they are warm and very professional. All the dogs was very happy, well behaved and absolutely gorgeous! at the time, when we were still deciding whether to go for it; we had never met a Pomsky before and wanted to suss out size and character. Needless to say, we fell in love. Jessica was attentive throughout the process, sending regular (and very welcome) puppy spam of the litter. Jessica has introduced us to a wider community of Pomsky lovers/owners, who love to share experiences and troubleshoot about this relatively new breed. Look forward to seeing all the pups and their pup-rents on their birthday in June 2018! Jessica at Prestige Pomskies has been amazing from the moment we sent our first email. She kept us informed at every step during Pearls pregnancy and has been extremely helpful with advice and tips along the way. The puppies are such a joy and have been well socialised with other dogs and children. They have been loved from the moment they were born and given the best start in life. We feel privileged to own two beautiful puppies and we can't imagine life without them. I'm lucky enough to have met all the dogs at prestige pomskies a number of times including all of the puppies. The are all amazing dogs with fabulous temperaments. The dogs and pups are great with children including my toddler and all love to be cuddled . They are all happy and healthy and socialise well in their pack and with other dogs and animals. I can't wait to add one to my family. I got my amazing pup from Pearls litter and he is absolutely fantastic.